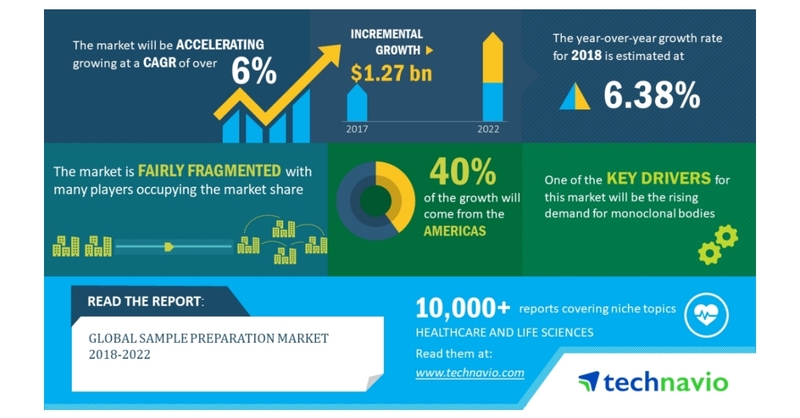 LONDON–(BUSINESS WIRE)–Technavio analysts forecast the global sample preparation market to grow at a CAGR of over 6% during the forecast period, according to their latest market research report. However, the growth momentum of the market is expected to decelerate due to a decline in the year-over-year growth. The increased investments in R&D is one of the major trends being witnessed in the global sample preparation market 2018-2022. Pharmaceutical and biotechnology companies are increasing their R&D investments to discover new drugs, owing to the increasing prevalence of chronic diseases and the growing demand for personalized medicine. This has increased the demand for sample preparation products such as automated workstations and liquid handling system. Monoclonal antibodies are identical immune cells and are the fastest growing products in the pharmaceutical industry. Some of the examples of monoclonal antibodies include Humira, Enbrel, Remicade, and Rituxan, which are manufactured using mammalian cell culture. The advantages provided by these monoclonal antibodies such as homogeneity, consistency, and east testing for cross-reactivity have increased their demand. The global sample preparation market research report provides market segmentation by end-user (pharmaceutical and biotechnology industry, research and academic institutes, and others) and by region (the Americas, EMEA, and APAC). It provides an in-depth analysis of the prominent factors influencing the market, including drivers, opportunities, trends, and industry-specific challenges. Of the two major end-users, the pharmaceutical and biotechnology industry held the largest market share in 2017, contributing to close to 45% of the market. The growth of the segment can be due to a wide range of product applications. The Americas held the largest share of the market in 2017, accounting for around 40% share. It was followed by EMEA and APAC respectively. The growth in the region can be due to the presence of many big pharmaceutical companies that use several kinds of sample preparation products based on different functions for testing and experimenting purpose related to disease diagnosis and drug development.